I love logic puzzles. You're given an image or set of images and you have to figure out what's alike between them or what rules were used in creating them. Doing just that is what you'll do in Zendo. One player will create an arrangement of pieces, then the other players have to guess at what secret rule was used in its creation. You can pre-order a copy for yourself now. After years of refinement and playtesting, we are proud to present our new vision of this popular 2003 classic. The new Zendo is available for pre-order now! 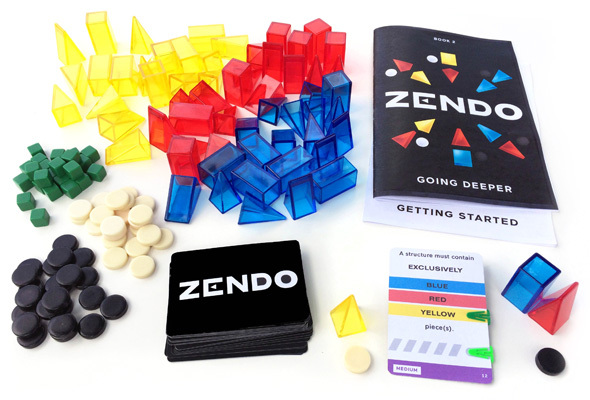 For those who’ve never played Zendo, it’s an inductive logic game in which one person serves as Moderator, and sets forth examples of arrangements of pieces (Structures) which either follow, or do not follow, a secret Rule. Players take turns building additional Structures and learning whether or not they also follow the secret Rule. The first player to officially guess the secret Rule wins!